Change threatens the harmony between Humans and Dragon in Dean DeBlois’ How to Train Your Dragon: The Hidden World. The How to Train Your Dragon franchise numbers among the strongest animated franchises with two previous entries that are roughly equal in quality and polish as well as a collection of series on Netflix that definitely have an audience even if I haven’t indulged in what they have to offer. This franchise works so well because the two cinematic entries are distinct from one another and further the world they belong to in really compelling ways. The first film was largely about acceptance as well as challenging what you have been taught about the world and the second was about fulfilling potential while overcoming personal hangups about accepting the next stage in life. The third film focuses on yet another distinct theme; this one is about embracing change even if it isn’t entirely positive and adapting to it because it comes whether you want it to or not. 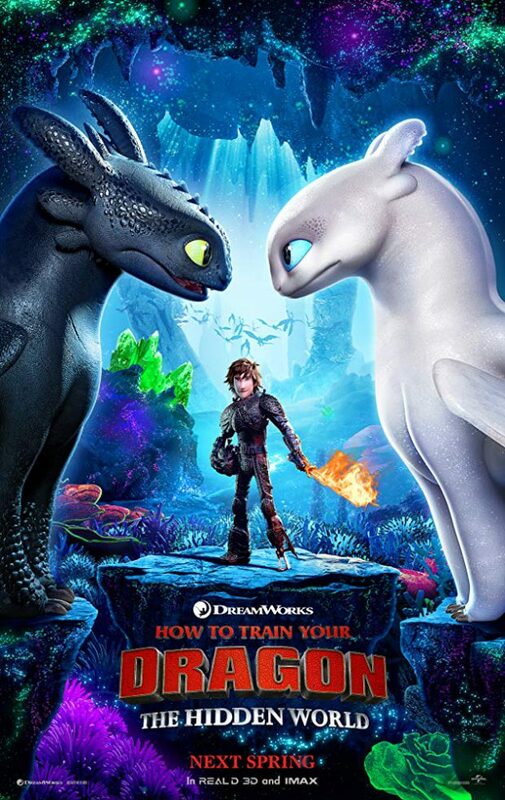 It’s a strong message and Hiccup (Jay Baruchel) acts as a compelling focal point to explore that because of his belief that the harmony achieved between his people and Dragons is the perfect way to live. It becomes clear that the current setup can’t last forever when a female Night Fury is discovered which is a big deal as it was believed that Toothless was the last of the Night Furies. The Hiccup/Toothless connection has been well established across the previous films so throwing in something that challenges that immediately makes for great drama. It’s a threat of sorts that can’t be combated as there’s no way Hiccup can compete with Toothless’ desire to be with his own kind and his arc is about realising that he has no right to get in the way of that. Toothless and the female Night Fury have a really charming back and forth that plays out without the intervention of any of the Human characters. It becomes clear that she won’t feel at ease unless Hiccup is nowhere near Toothless so he has to step back and let them get to know each other without his intervention. The results are both hilarious and heartwarming with a visually stunning sequence involving them flirting while flying through the eye of a storm being an unchallenged highlight. The film does a great job building this connection naturally and making it apparent that this is what Toothless has been missing up until this point. All of this is done without damaging his relationship with Hiccup as it’s clear that their connection is important to Toothless as well but that doesn’t necessarily mean that their current dynamic is how it’s going to be forever despite how much they both value it. Things have to change and there’s a symbolic gesture on Hiccup’s part when he builds an upgraded tail that allows Toothless to fly without him. It’s a visual representation of growth that ties into the theme of change being inevitable. Another relationship that receives a great deal of attention is Hiccup and Astrid (America Ferrera). As with everything this ties into the theme of change being inevitable as they are both presented with large scale requestions regarding their place within their society and responsibilities they may have to each other. They are close to an important turning point and the film builds up to this gradually. Also tying into the notion of change is the appearance of a new villain in the form of F. Murray Abraham’s Grimmel. The previous films had anti-Dragon sentiment motivated by ignorance and fear where Grimmel is motivated by pure hatred that he both understands and embraces. Every fibre of his being is devoted to finding different ways to kill Dragons and he has even found ways to enslave them. He represents a world that isn’t ready to understand or accept Dragons which forces the people of Berk to consider what the future looks like for their people and the Dragons. Grimmel is a decent villain but doesn’t ever rise to the threat level that the film seems to think that he does. It has a lot to do with a lack of proper exploration of what personally motivates him. His views are clear but it would have been interesting to learn what brought them on and how he embarked on his relentless quest to kill Dragons. More could have been made of him representing a barrier to change against Hiccup’s development towards accepting the inevitability of it. Thankfully the threat of Grimmel is countered by hope created through the legend of the Hidden World. Legend tells it that the Hidden World is the ancestral home of Dragons and is a place they can be safe without fear of discovery by those who want to harm them. At the beginning of the film Hiccup believes that his people have earned the right to belong there as well so he petitions them to abandon their home and seek out the Hidden World so that they can make that their new home. It’s a reasonable pan on the surface as it solves the problem of overcrowding in Berk that clearly homes more Dragons than it can reasonably handle and allows for a safe long term home where everyone can be happy. Of course the reality is far more complicated than that as he doesn’t actively consider what the Dragons might want out of this. Sure the Dragons that live in Berk are happy enough to live there because they are safe and accepted but given the option of their own home where they can be free to be among their own kind without interference might make them feel differently. The Humans don’t own the Dragons so assuming they will be welcomed into the Hidden World is somewhat naive. This assumption doesn’t harm the film in any way because the entire plot is crafted around coming to that realisation and the point where it happens is beautifully handled because it focuses on the seemingly unbreakable connection between Hiccup and Toothless. I won’t spoil exactly what happens but there’s a scene towards the end of the film that encapsulates that lesson in a powerful and emotionally real way. The weight of this theme doesn’t compromise on the sense of humour at all. This is still a very funny film with consistently hilarious gags that land most of the time. There’s a particularly hilarious moment involving a character being captured by the villain that I won’t spoil and there are similarly clever jokes throughout. If this is to be the end of the How to Train Your Dragon franchise then this is a worthy conclusion. It furthers the characters in really profound ways, keeps things focused on the key relationships and brings things to a satisfying end point that feels wholly earned. Dreamworks have outdone themselves on the visuals once again; the Hidden World is beautifully realised with its own visual identity that feels both part of this world and outside of it. There’s a timeless quality to these films that hopefully allows them to reach generation after generation of young minds ready to absorb the lessons that the three films have to offer. A satisfying heartwarming conclusion to what can now be called one of cinema’s greatest trilogies. The theme of change whether that be good or bad is expertly explored through the characters, their relationships and how they choose to tackle the future. On his own the central antagonist is somewhat weak but what he represents is very strong which largely makes up for this. If this is to be the last entry in this franchise then it’s a worthy conclusion that exceeds expectations on almost every level.